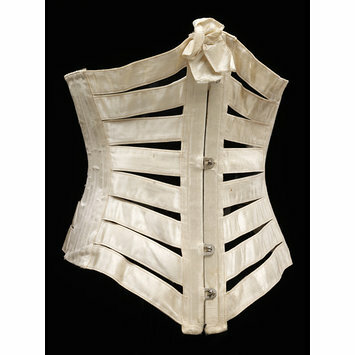 "Ribbon corset" made from strips of cream silk satin ribbon connecting boning and lacings, metal fastenings. 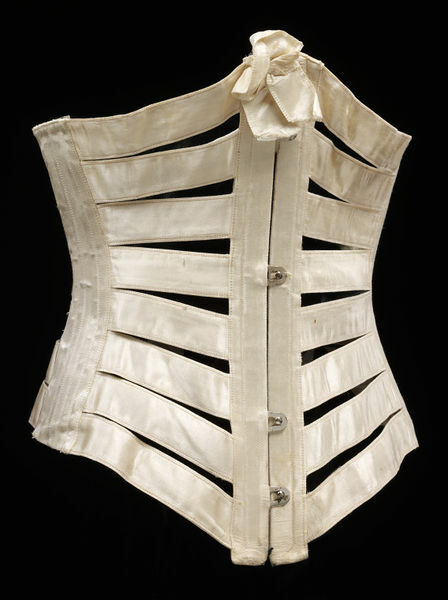 Ribbon corsets were recommended for slender women for summer. This one was worn by a woman from a merchant family living in Brazil: Fanny Harvey Fleetwood Raper, nee Duder (1879-1957). While the upper edge of the corset lies under the bust, allowing more freedom of movement, the bones in the sides constrict the waist and those in the back reinforce an upright posture.